Summary: Microsoft Scripting Guy, Ed Wilson, talks about using Windows PowerShell and WMI to obtain basic operating system information. Hey, Scripting Guy! I need to check on computers on my network to find out the operating system, service pack level, and whether the computer has been rebooted in the last 30 days. Can you help with this? Microsoft Scripting Guy, Ed Wilson, is here. The Scripting Wife is starting to get excited about the MVP Summit in Redmond. She was out there a few years ago with me, and she loved the chance to meet so many MVPs from all over the world. This is her first year going as an actual MVP, and she is heading there without me. The most important information from this output is the build number and the version. Actually, the version is all I need these days. The build is 9600 and the version is 6.3.9600. So that is major version 6, minor version 3, and build 9600 (which ends up being Windows 8.1). Now I have basic information and extended information. But the requirements are pretty specific: Operating System, Service Pack level, and whether rebooted in the last 30 days. 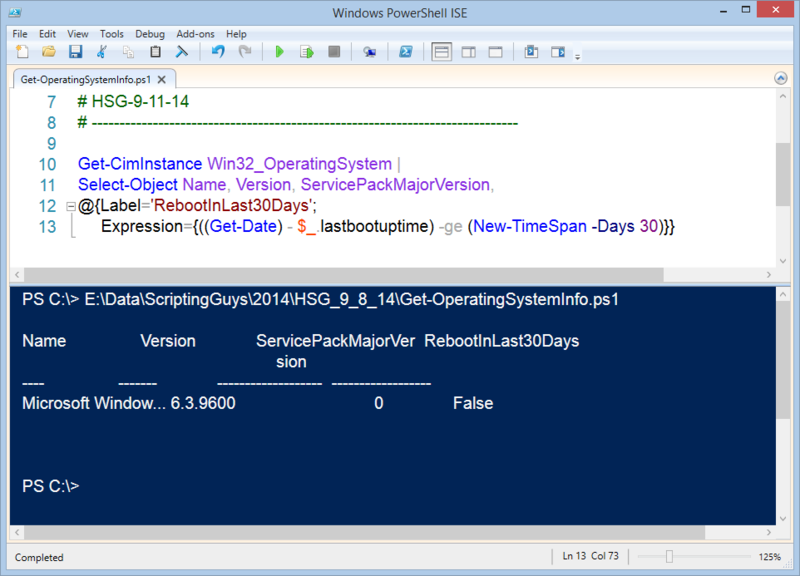 I could do this at the Windows PowerShell console, but I may as well fire up the Windows PowerShell ISE and do it there. It will be neater. DD, that is all there is to using WMI to obtain operating system information. WMI Week will continue tomorrow when I will talk about more cool stuff.